Berlin has so many temptations, maybe too many. Finding the best of them could be a matter of luck, inspiration or good research. With only a few free days left to spend in Berlin before the long travel vacations, I want to be left only with the best memories of this short summer. Plus, being on the road most of the time, left me only with few chances to see my old friends in the city. Thus, any good tips are more than welcomed for spending the time at its best. 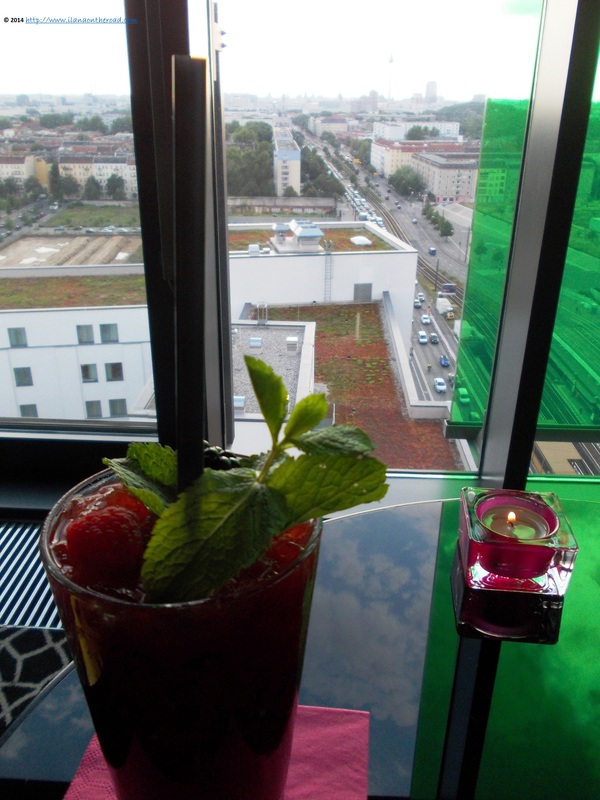 As a guest of the sky.bar, at the last floor of andel's hotel Berlin, I give a big chance to a cocktail o'clock evening. 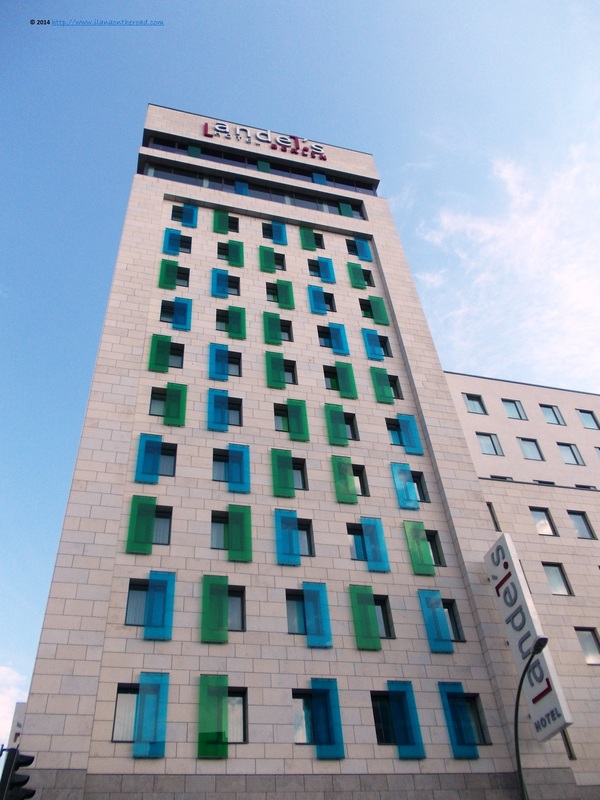 The colourful design andel's hotel is easy to notice, from the S-Bahn station Landsberger Allee. Although situated in an area without any big tourist temptations, the hotel can be easily reached by Ring S-Bahn and in less than one hour you can be to any famous landmarks of the city. The list of cocktails is long, and the combination of ingredients is highly elaborated. Either the mixture may sound too extravagant or too unique to be true, the temptation is always there. Besides the classical recipes, many of the cocktails do have fresh fruits or veggies and spices added to top brands alcoholic drinks. My friend is a bit faster than me when it comes to choices and much more brave to try Picante cocktail, combining: dark rum, strawberry liqueur, raspberry liqueur, limes, fresh strawberries and raspberries, balsamic glaze, pepper, lime juice and cane sugar syrup. The fresh fruits are bringing tonic flavours to the rum, while the pepper is adding some strong notes, balanced only by the cane sugar syrup. Little by little, people are arriving, although the evening is still young. 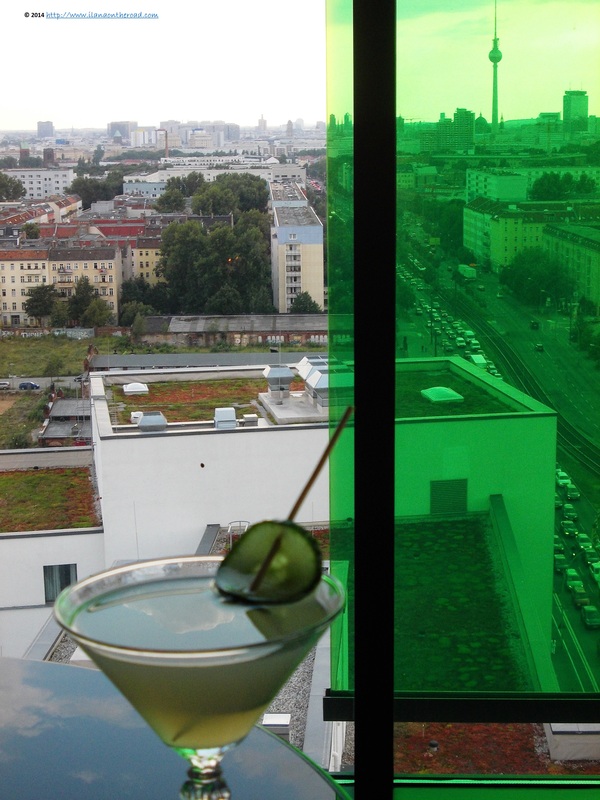 The usual ritual is to find a good spot, to order the cocktail and while waiting, to make a tour of the glass windows for taking pictures of the iconic locations of Berlin that can be seen. The chairs and tables are situated in close vicinity, which create a little problem sometimes, especially if you dare for more privacy. However, there are enough good spots where you can spend a good time, with a good view, without being bothered or bothering the others. 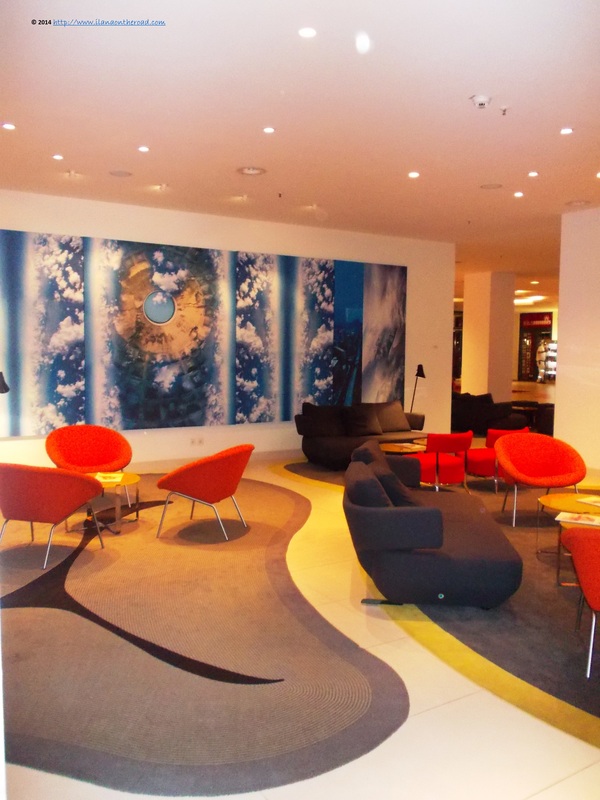 The design follows the main lines of the overall design of the hotel, made up of different colourful splashes, placed in the most unexpected corner, that bring a certain youngish accent to the space. My first cocktail choice is the green goblin: Hendrick's gin, lychee liqueur, lychee, cucumber, lime juice, cane sugar syrup. It is refreshing, although not very cold, with a lot of sweet accents, brought in by the cane syrup and developed in an unique taste by the lychee. 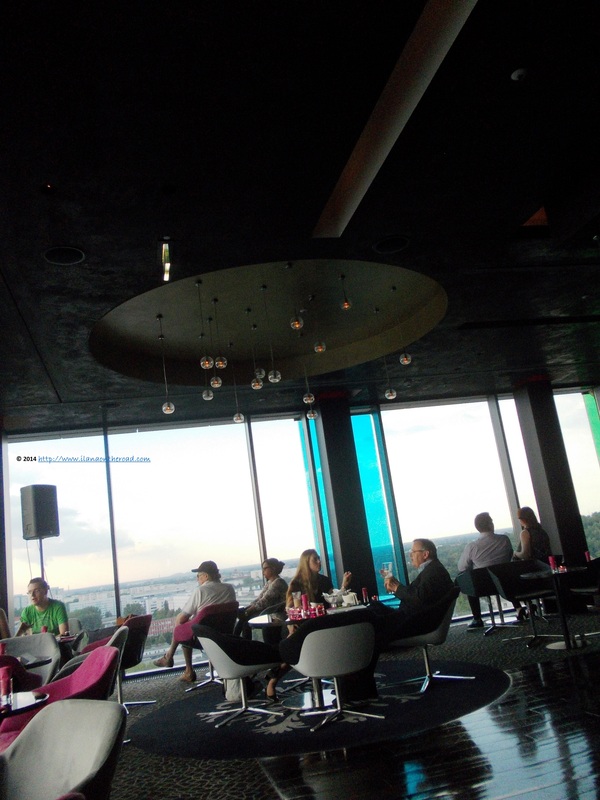 The sky.bar also has a long food menu, mostly sandwiches and finger food. 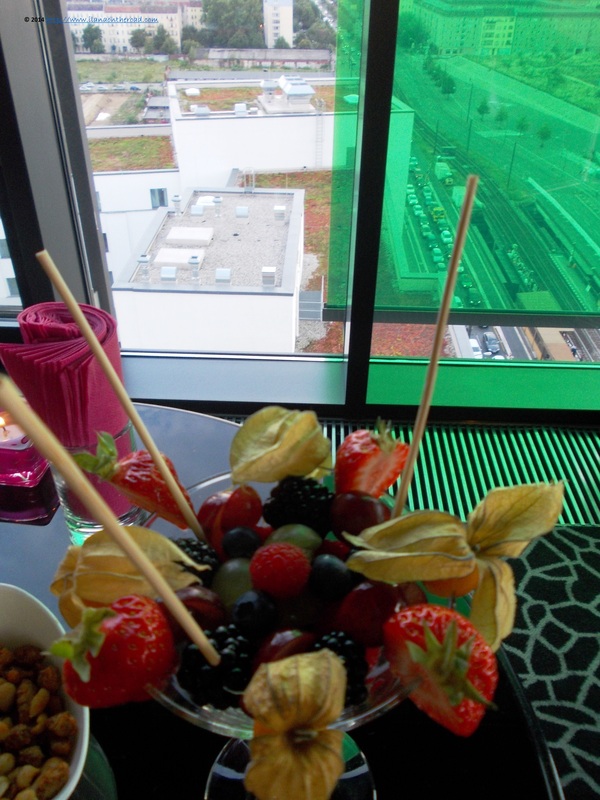 Roasted salty nuts and a bowl of fresh fruits were part of the very fast and bilingual - German/English - service. Time goes fast especially when you want the least, and we are ready for the next orders. 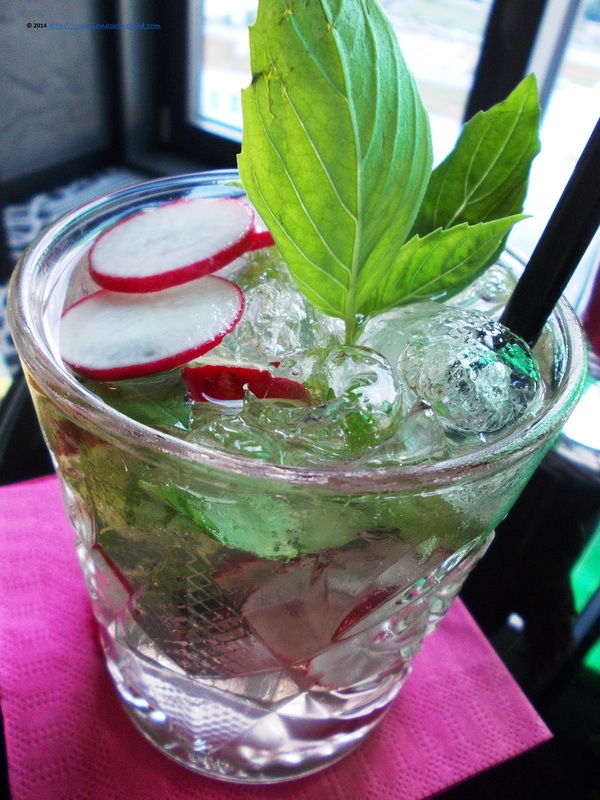 My friend is set for the gingerly Six Feet Under: pepper vodka, ginger beer, radishes, basil, lime juice. Although two alcohols in a cup can be a bit risky, the predominance of ginger beer reduces the strength of pepper vodka. The veggies and the lime juice are contributing to the freshness and a sparkling note. Very good choice for the summer time. 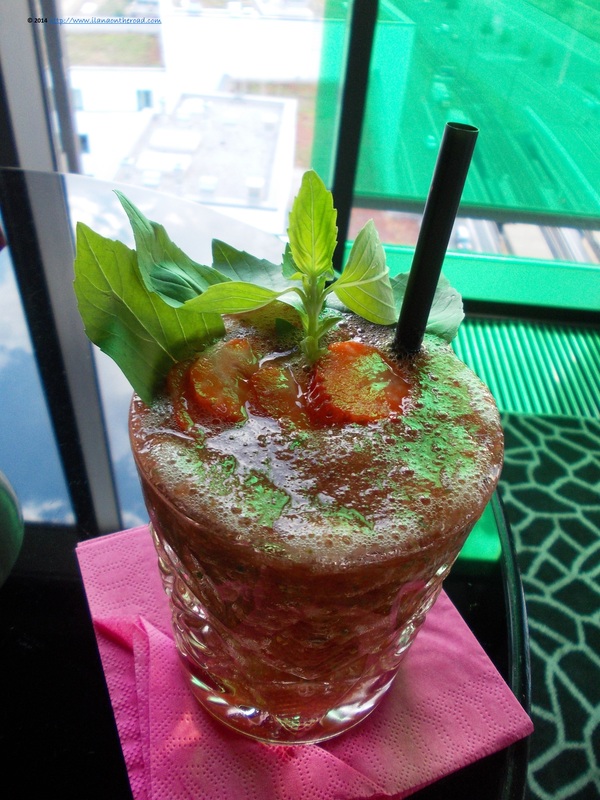 I am trying a Strawberry-Basil Margarita: tequila, strawberry liqueur, strawberry purée, fresh strawberries, basil, lime juice and cane sugar syrup. It may look as a very elaborated fresh fruits salad, but it's very serious, thanks to the tequila drops. Adding basil contributed to the bouquet of strong flavours, while the strawberries brought a lot of natural sugar reducing the strength of tequila. When we are about to leave, it is late in Berlin, but people are still trying their luck to discover a different city. At least, the iconic TV tower is easiest to recognize. As for me, I hope to be brave enough to try to see how does the city looks covered by snow. I'm grateful though that there is so much time till then, although the idea of trying a new different cocktail soon is even more appealing. Disclaimer: I was the guest of sky.bar for a cocktail's evening, but the opinions are, as usual, my own.